A leader should be a father when it comes to discipline. He/she should be a mother when it comes to caring. A teacher when it comes to imparting knowledge. A guide when it comes to showing the right path. A friend when it comes to personal issues. 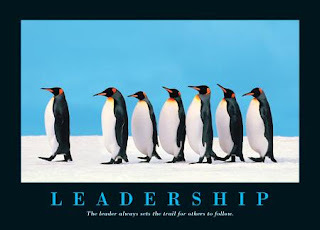 A leader is someone who leads from the front. He should set an example so that people follow him with faith. If he expects his team to be sincere and committed to work, he will have to show the same sincerity and commitment towards work. If a leader expects his team to do whatever work is assigned to him, then he too should take up any task when the situation demands so that the team feels motivated. A leader should be a great listener and a good observer too. He should be patience personified. He should be proactive in making decisions and solving problems. He should have a democratic approach towards decision making. When he involves his team in decision making, he makes them feel important. This will reflect in the way they approach their task. When two people work together difference of opinion is bound to happen. So, just imagine a team of 10 or more people. The chances of misunderstanding and clash of views is inevitable here. Here the leader has to play a very important role. He has to bring about consensus within the team and make the team understand what the objective of the team is. He should be able to convince the team that the decision being taken is in the larger interest of the team and one that will help them achieve their targets. This would lead to a positive reaction within the team even if their opinions and decisions were not considered. If they know why their opinion was not considered, they will not react in a negative manner. "Leadership is the art of getting someone else to do something you want done because he wants to do it. " The UPA government which was so vocal about seeing the Indo-US Nuclear Deal go through, ultimately bogs down to the Left parties demands. They are not ready for elections and if they went through with the formalities for the deal, election was inevitable. However, my concern is not about the Nuclear deal falling flat. My issue here is that if the Left parties were so concerned about national security what were they doing when these talks were initiated by the UPA. At that time no one opposed. All the time, energy and money spent for the deal is now a big waste of public money. The fear of election, the fear of losing the government all resulted in the UPA taking an about turn. The honourable Prime Minister of India, Dr. Manmohan Singh and the President of the Congress party, Ms. Sonia Gandhi both were very vocal in their support for the deal. But now it is all history. Now India is in a very embarassing situation. The world was watching all the events very closely. It is only the Left parties that benefit from the current situation. They now know that the UPA goverment is nothing but just a puppet in their hands. They know how to pull the strings to make the goverment take decisions according to their will. The thing I really hate about the Left parties is that they never be part of the goverment at the Centre. This attitude of theirs I feel is to ensure that they get all the benifits of the good work done by the goverment and at the same time shy away from taking responsibility for anything that goes wrong. The last thing I would like to see is a goverment of the Left parties at the Centre. I do not like any of the political parties in India. However, I hate the Left parties for the way they are handling the states they have a strong presence in. They are anti-development. In every other party there are individuals who are pro-development. They may be limited in number but atleast they are there. I wish I could say the same about the Left parties. SC vs. DMK - A bandh call, legal or illegal? It hurts to see a state government and the judiciary at logger heads with each other. This is what is happening because of the stand taken by M. Karunanidhi, the Chief minister of Tamilnadu and the veteran leader of the DMK over the Sethusamundaram project. It all started after the Archaelogical survey of India (ASI) filed an affidavit on Ram Setu (Ram Setu or Adam's bridge is believed to be a bridge made by Lord Rama to cross over to Lanka in his efforts to rescue his wife Sita). The ASI questioned the very existence of Ram in it's affidavit. This prompted a huge backlash from BJP. After all Ram had helped them gain power. The Vishwa Hindu Parishad too came out strongly against the affidavit. They strongly opposed the affidavit filed by the ASI. The UPA government withdrew the affidavit immediately as it hurt the religious sentiments and faith of the Hindus. But the Chief Minister of Tamil Nadu continued to question the existence of Ram. He went to the extent of saying that was Ram an engineer and if yes from which college he completed his engineering course to have built such a bridge. This statement was totally uncalled for from a person holding a high post of that of a Chief Minister. His personal beliefs on the existence of Ram cannot be imposed on the larger Hindu population who strongly believes in his existence. Will the DMK chief ever dare to make a similar statement questioning the existence of Mohammad Paigambar or Lord Jesus Christ? No, he won't. Whether Ram existed or not is something that cannot be proved. But then there are many things in this world that is believed to have existed and not proved to have existed. Even many scientific beliefs are based on so many theories. Theories may not be true. They too are assumptions made by scientists. They believe that the theories are true. If you ask those scientists to prove that they are true they may not be able to do so. The BJP leaders and M. Karunanidhi had verbal duels over this issue. BJP office was ransacked by DMK supporters. M. Karunanidhi decided to call for a Tamilnadu bandh on 1st of October, 2007. The AIADMK headed by J. Jaylalitha went to the High court first. The High Court did not take exception to the Bandh. Then the AIADMK approached the apext court (Supreme Court) on Saturday. In a special hearing held on Sunday, the Supreme court declared the Bandh as illegal. However, the CM of Tamilnadu decided to go on a hunger strike from dawn to dusk. The people are confused as to venture out or not. It is still a bandh like situation. The SC has now asked the Centre why Presidential rule cannot be imposed based on the stand taken by M. Karunanidhi. A more rational approach M. Karunanidhi could have taken would have been to make a statement saying that if Ram would have existed today, he too would have supported destruction of the bridge if it would have been a hindrance to development. Though I personally feel that if there is an alternative way that ensures that both religious sentiments and development is not adversely affected, we should go for it. A bandh is not the right way to protest. Anything that affects normal life adversely cannot be considered legal. Common people have to suffer because of bandhs or hartals. The state of Kerala is the best example where people have to suffer a lot because of hartals called by one political party or the other. I compare bandh and hartal calls to kidnapping or hijacking. It is like holding someone captive to demand something. In other words, a bandh and hartal call can and should be equated to terrorism.